1. 1938 — R.N. Elliott’s book The Wave Principle introduces the idea that stock market prices move in waves, which take the form of a self-affine, hierarchical fractal. 2. 1940 — R.N. Elliott publishes “The Basis of the Wave Principle,” a treatise elaborating on Charles Collins’ observation that the numbers of waves in his empirically derived model conform to the Fibonacci number sequence. 3. 1946 — R.N. Elliott’s second book, Nature’s Law—The Secret of the Universe, includes additional discoveries and observations and is considered his definitive work on the Wave Principle. 4. 1969 — Nineteen-year-old Yale University student Robert R. Prechter edges toward the socionomic insight when in a college paper he contemplates the connection between song lyrics and trends in the economy. 5. December 1975 — Shortly after becoming a technical analyst with Merrill Lynch in New York, Prechter realizes that there is a link between the character of popular music styles and the path of the stock market. 6. November 1978 — A.J. Frost and Prechter’s Elliott Wave Principle—Key to Market Behavior is published. It articulates socionomic principles on psychological aspects (“personalities”) of waves and on the irrelevance, rationalization, lagging nature and parallel tenor of news. 8. October 1982 — The Elliott Wave Theorist makes its first socionomic forecast. 9. August 1985 — Prechter writes a 20-page special report, “Popular Culture and the Stock Market,” detailing manifestations of social mood in popular music, film and fashion. 10. September 1985 — Prechter’s socionomic insight reaches a national audience when his article, “Elvis, Frankenstein and Andy Warhol,” becomes a cover story in Barron’s. 11. 1988 – 1992 — Business journalist Peter Kendall begins analyzing cultural trends for several stock market and business journals. In 1992, Kendall joins Elliott Wave International and begins writing socionomic commentary for Prechter’s monthly publication, The Elliott Wave Theorist. 12. 1997 — Elliott Wave International names Kendall director of the Center for Cultural Studies, an early precursor to the Socionomics Institute. 13. November 1997 — Prechter presents the Wave Principle of social behavior in a talk titled “The Mathematical Basis of History” at the International Conference on the Unity of the Sciences in Washington, D.C.
14. March 1999 — Jordan Kotick heads the new Socionomics Department at Elliott Wave International, the next precursor to the Institute. 15. March 1999 — Prechter’s book, The Wave Principle of Human Social Behavior and the New Science of Socionomics, is published. The book becomes the first entry in the socionomics book series. 16. May 2000 — Prechter gives a presentation on socionomics to the Market Technicians Association’s Annual Conference in Atlanta. 19. March 2002 — Market Analysis for the New Millennium, a collection of essays relating to Elliott waves and socionomics, is published. 20. April 2002 — Prechter presents “Wave Theory of Social Behavior and Markets” to the Sixth Congress on the Psychology of Investing in Boston. 21. August 2002 — John Casti’s article on socionomics and Elliott waves is the cover story in the August 31, 2002 edition of New Scientist. 22. September 2002 — Gordon Graham becomes director of the newly named Socionomics Institute, a division of Elliott Wave International (EWI). 23. November 2002 — With guidance from Graham, John Nofsinger of Washington State University (WSU) and Kenneth Kim of SUNY-Buffalo conduct the first socionomic study by outside researchers. It reveals a relationship between social mood and the character of Congress’ financial regulations [reprinted in Pioneering Studies in Socionomics, 2003]. 24. 2003 — A forerunner of the Socionomics Foundation issues a grant to Nofsinger to write a research paper on social mood and corporate behavior. 25. February 2003 — Prechter and Graham meet neuroscientist Greg Berns of Emory University to discuss a way to test the socionomic proposition that herding and rational thought involve different areas of the brain. 26. May 2003 — Pioneering Studies in Socionomics, a collection of essays and studies by socionomists, is published. The book becomes the second entry in the socionomics book series. 27. June 2003 — Socionomics: The Science of History and Social Prediction, a box set containing the first two entries in the socionomics book series, is released. 28. September 2003 — Prechter briefly presents the socionomic hypothesis at the Neuroeconomics Conference in Martha’s Vineyard, Massachusetts. 29. September 2003 — Prechter presents “Fundamentals of Finance and Socionomics” to faculty and graduate students at MIT’s Laboratory for Financial Engineering. 30. September 2003 — Dr. Wayne Parker of the Emory University School of Medicine joins the Socionomics Institute as Director of Research. 31. September 2003 — On September 18, Casti gives the first of his many presentations on socionomics, “How History Happens, or Why the Conventional Wisdom is Always Wrong,” at the Complexity, Ethics and Creativity Conference at the London School of Economics and Political Science. 32. 2003-2008 — The Socionomics Foundation gives professor Green a series of grants to conduct and share socionomic research. Green produces thirteen conference presentations, several research papers and a book and obtains a residency at the University of Cambridge. Green adds aspects of socionomics to his course material. 33. January 2004 — The not-for-profit Socionomics Foundation is officially incorporated, with Parker as Executive Director. Its purpose is to support education and research related to socionomics. 34. March 2004 — Prechter delivers a two-hour lecture, “Socionomics: Social Mood Is the Engine of Social Activity,” before a packed lecture hall at the London School of Economics. 35. September 2004 — Marius Alexe, an MBA student at McGill University in Montreal, forms the world’s first socionomics club. 38. March 2005 — The Socionomics Foundation issues a research grant to Kenneth Olson, professor of psychology at Fort Hays State University, to conduct a review of social mood literature. 39. August 2005 — Parker presents “Herding: An Interdisciplinary Integrative Review from a Socionomic Perspective” at the International Conference on Cognitive Economics in Sofia, Bulgaria. 41. October 2005 — The Socionomics Institute is separately incorporated, with Robert Prechter as Executive Director. 42. October 2005 — Prechter discusses “The Socionomic Model of Financial and Social Causality” at the annual conference of the Canadian Society of Technical Analysts in Montreal. 43. November 2005 — Prechter presents “The Socionomic Model of Financial and Social Causality” at SUNY-Plattsburgh. 44. 2006 — Management cybernetics expert Constantin Malik teaches a course about socionomics at the University of Klagenfurt in Austria. 45. March 2006 — A 60-minute documentary, History’s Hidden Engine, by filmmaker David Edmund Moore, explains socionomics and its connection to changes in fashion, music, economics, politics and history. It features the views of Casti, Nofsinger, Parker, Hernán Cortés Douglas, Abraham G. Kocheril, Paul Macrae Montgomery, Donald Ratajczak, Didier Sornette and members of the Socionomics Institute. 46. May 2006 — The Socionomics Foundation issues a grant to Julie Hall of Stanford University for brain imaging research. Hall finds that subliminal images of facial expressions generate activity in unconscious areas of the brain and affect traders’ decisions. 47. June 2006 — The American National Elections Survey (ANES) chooses Parker to compose polling questions designed to generate social mood data for a pilot study. 48. July 2006 — Mark Galasiewski begins writing socionomics essays for The Elliott Wave Theorist. His study on car colors [republished in Socionomic Studies of Society and Culture, 2017] prompts discussion in Radar Magazine. 49. July 2006 — Parker presents “The Socionomic Theory of Finance and the Institution of Social Mood: Pareto and the Sociology of Instinct and Rationalization” at The Eighth Annual Conference of the Association for Heterodox Economics in London, England. 50. July 2006 — Parker presents “Methodological Individualism vs. Methodological Holism: Neoclassicism, Institutionalism and Socionomic Theory” at the Congress of the International Association for Research in Economic Psychology and The Society for the Advancement of Behavioral Economics in Paris, France. 51. August 2006 — IMF economist, World Bank Economic Research Manager and Harvard University Luksic Scholar Hernán Cortés Douglas argues on behalf of socionomics in “Toward a Revolution in Macroeconomics” [Chapter 36 of Pioneering Studies in Socionomics], presented at the 8th Biennial Alternative Perspectives on Finance Conference in Zakopane, Poland. 52. Q4 2006 — The Journal of Behavioral Finance publishes Olson’s review of social mood literature. 53. June 2007 — Prechter and Parker’s “The Financial/Economic Dichotomy in Social Behavioral Dynamics: The Socionomic Perspective” is published in the Journal of Behavioral Finance. 54. August 2007 — The Sydney Morning Herald publishes Economics Editor Ross Gittins’ article, “The Herd’s Suffering Mood Swings Again.” It is the first mainstream news publication to explore the financial/economic dichotomy delineated in Prechter and Parker’s 2007 Journal of Behavioral Finance paper. 56. September 2007 — Marah Boyesen begins incorporating socionomics in her finance classes at a private high school in Pennsylvania. 57. April 2008 — Elliott Wave International launches The Asian-Pacific Financial Forecast. Editor Galasiewski begins including socionomic commentary in his monthly market analysis. 58. 2008 – 2011 — Professors Johan Bollen, Eric Gilbert and Peter Gloor conduct research on the relationship between emotional expressions via social media and subsequent financial market activity. 59. January 2009 — Casti and researcher Leena Ilmola launch the Extreme Events in Human Society exploratory program at the International Institute for Applied Systems Analysis (IIASA) in Vienna. They incorporate socionomics in their approach to social forecasting. 60. February 2009 — Brian Whitmer becomes editor of The European Financial Forecast and begins including socionomics commentary in his monthly market analysis. 61. April 2009 — The Institute launches The Socionomist, a monthly publication featuring socionomic analysis of history, current events and future trends. 62. May 2009 — The Socionomics Institute releases Toward a New Science of Social Prediction: Robert Prechter at the London School of Economics, which captures Prechter’s 2004 lecture on DVD. 63. August 2009 — New Scientist covers Socionomics Institute researcher Euan Wilson’s study on marijuana prohibition. 64. September 2009 — Professors Robert Sizemore of Quinnipiac University and Meriem Chida of WSU incorporate socionomics into their classes. 65. September 2009 — The Institute awards its first Research Fellowship to Matt Lampert to pursue post-graduate study at the University of Cambridge. 66. November 2009 — USA Today introduces readers to the socionomic perspective in an article on the connection between social mood and popular music, television shows and movies. 67. January 2010 — Rob Goodman, one of Chida’s students, receives an undergraduate research grant from WSU’s College of Agricultural, Human and Natural Resource Sciences to pursue his work on the relationship between social mood and fashion trends. 68. February 2010 — Mark Almand is named director of the Socionomics Institute. In the next three years, the Institute grows to eight full-time staffers and several part-time contributors. 69. February 2010 — Prechter presents “The Socionomic Theory of Finance” to students and faculty at the University of Cambridge. 70. March 2010 — Three of Chida’s students present their research on social mood and fashion trends at WSU’s annual Academic Showcase. 71. March 2010 — Professor Green wins the Susan Sutton Smith Prize for Academic Excellence due in part to research funded by the Socionomics Foundation. 72. May 2010 — Copernicus Books publishes Casti’s Mood Matters: From Rising Skirt Lengths to the Collapse of World Powers. 73. July 2010 — Prechter introduces the fractal model of social-trend projection to the World Future Society in Boston at its annual conference. 74. September 2010 — Nature and Science magazines review Casti’s book, Mood Matters. 75. October 2010 — Time magazine interviews Wilson about his research on social mood and the growing social acceptance of marijuana. 76. November 2010 — Prechter presents “A New Perspective on Financial, Economic and Social Causality” to students and faculty at the University of Oxford and at Trinity College, Dublin. 77. March 2011 — Campus Verlag publishes Constantin Malik’s Ahead of Change, a book on socionomics, cybernetics and public policy. 78. April 2011 — The Socionomics Institute hosts its inaugural Social Mood Conference at the Georgia Tech Conference Center in Atlanta. The conference features academics who study social mood and practitioners who apply it in business and finance. Presenters include Prechter, Casti, Bollen, Gilbert, Olson, Kendall, Lampert, Huina Mao and Kevin Depew. 79. May 2011 — Lampert’s presentation on socionomics wins “Best Presentation” at the University of Cambridge’s Conference on Everything, sponsored by Churchill College. 80. May 2011 — Lampert speaks about socionomics at the European Futurists Conference’s Tipping Points Workshop in Mt. Pilatus, Switzerland. 81. June 2011 — Lampert receives a National Academy of Sciences grant to contribute to Casti and Ilmola’s work. 82. September 2011 — Lampert presents socionomics to attendees at the Annual Meeting of the Academy of Behavioral Finance and Economics at the University of California-Los Angeles. 83. October 2011 — Dennis Elam, accounting professor at Texas A&M-San Antonio, gives an on-campus socionomics presentation, “Cycling through History: How Social Mood Determines Your Career Success.” He begins incorporating socionomics into his course material. 84. January 2012 — Prechter, Deepak Goel, Parker and Lampert’s paper, “Social Mood, Stock Market Performance and U.S. Presidential Elections: A Socionomic Perspective on Voting Results,” is posted on the Social Science Research Network (SSRN). The Washington Post, the Associated Press, The Hill and other media outlets cover the paper. 85. February 2012 — Adjunct professor and institutional financial consultant Peter Atwater begins teaching an honors colloquium on “Social Mood, Decision Making & Markets” at the University of Delaware. 86. April 2012 — Three months after its posting, the Institutes’s elections paper becomes one of SSRN’s most-downloaded papers of the year. 87. April 2012 — The Institute holds its second annual Social Mood Conference at the Georgia Tech Conference Center in Atlanta. Presenters include Terry Burnham, Richard L. Peterson, Kevin Coogan, Jose Carlos Carvalho, Ilmola, Kotick, Lampert, Mao, Atwater, Almand, Wilson and Prechter. 88. July 2012 — Minyanville Media publishes Atwater’s Moods and Markets: A New Way to Invest in Good Times and in Bad, a book on socionomics geared toward institutional asset managers. 89. July 2012 — Prechter presents the Institute’s elections paper and discusses the socionomic causality of trends in popular culture at FreedomFest in Las Vegas, Nevada. 90. July 2012 — Lampert and Institute intern Idan Hodor introduce Elliotticity as a stylized fact of financial time series at the International Symposium on Forecasting in Boston, Massachusetts. 91. August 2012 — The Wall Street Journal publishes Elam’s letter on negative social mood and dark themes in popular entertainment. 93. September 2012 — Lampert presents the Institute’s elections paper at the Elections, Public Opinion and Parties Conference at the University of Oxford. 94. November 2012 — The Institute’s elections paper is published in the peer-reviewed journal, SAGE Open. In line with the study’s implications, incumbent U.S. president Barack Obama is re-elected following a 3½-year rally in stock prices. 95. November 2012 — Lampert presents the Institute’s elections paper at Churchill College, University of Cambridge. 96. November 2012 — The Institute’s elections paper becomes the third-most-downloaded paper for the preceding 12 months on SSRN.com. 97. November 2012 — Dr. Wayne D. Parker, author and co-author of landmark papers about socionomics and founding Executive Director of the Socionomics Foundation, dies of carcinoid cancer at age 61. 98. November 2012 — Casti presents “How the World Works: Why We Do What We Do—and Not Do Something Else” at TEDxVienna. 99. January 2013 — Wilson presents the Institute’s elections paper to the American Politics Group of the Political Studies Association Conference at the University of Leicester. 100. March 2013 — Alan Hall, Lampert and Sebastian Di Cesare post their working paper, “Using Stock Market Indexes to Anticipate Elevated Public Health Risk: A Socionomic View of Epidemic Disease,” to SSRN.com. 101. April 2013 — HSBC’s Murray Gunn completes the first independently conceived and executed socionomic study, “How Comparing Sectors Reveals Underlying Social Mood and Helps You Invest Better.” A later study by Gunn, “Beyond The Redline: Socionomic Relationship Between Speed and Markets; 200mph Motorcycle Could Coincide with a Top,” is published in the June 2015 HSBC’s Long Wave Outlook [reprinted in Socionomic Studies of Society and Culture, 2017]. 102. April 2013 — The Institute hosts its third annual Social Mood Conference at the Georgia Tech Conference Center in Atlanta. Presenters include Michelle Baddeley, Mark Buchanan, Rishab Ghosh, Philip Maymin, Tobias Preis, Marah Boyesen, Jon Clifton, Kevin Armstrong, Gunn, Hall, Almand and Prechter. 103. May 2013 — The Institute releases Prechter’s presentations to Oxford, Cambridge and Trinity on DVD. 104. June 2013 — Reuters quotes Prechter, Atwater, Burnham, Gunn and Peterson in an article on social mood and markets. 105. June 2013 — Wilson connects social mood, the stock market and marijuana legalization on Yahoo! Finance’s “Breakout” program. 106. July 2013 — Hall presents the Institute’s working paper on epidemics to the behavioral finance conference, SABE/IAREP/ICABEEP 2013, in Atlanta. 108. September 2013 — Hall presents the Institute’s research on social mood and epidemics at the Annual Meeting of the Academy of Behavioral Finance and Economics at DePaul University in Chicago. 109. September 2013 — Hall introduces socionomics to faculty and students at the Stevens Institute of Technology in Hoboken, New Jersey. 110. October 2013 — Kevin Armstrong’s book, Bulls, Birdies, Bogeys & Bears, The Remarkable and Revealing Relationship Between Golf & Investment Markets, is published. He expands upon Kendall’s socionomic insights on the history of golf in his study of the sport. 111. October 2013 — Wilson presents “Much of How You’re Taught to Think Is Wrong—An Introduction to Socionomics” at an event hosted by the Bryn Athyn College Business Club. 112. November 2013 — Galasiewski’s speech at the Irrational Economic Summit in La Jolla, California features socionomic commentary on the Asian-Pacific region. 113. December 2013 — Businessweek interviews Wilson about the relationship between social mood and the drug war. 114. April 2014 — The fourth annual Social Mood Conference at the Georgia Tech Conference Center in Atlanta features a keynote address by behavioral finance pioneer Werner DeBondt as well as presentations from Kenneth Kishida, Suzy Moat, Thomas Brudermann, Alan Brochstein, Mikko Ketovuori, Dave Allman, Atwater, Hall, Almand, Lampert and Prechter. 115. May 2014 — Wilson gives an introductory lecture on socionomics at Golden Gate University. 117. September 2014 — Prechter presents his and Parker’s 2007 Journal of Behavioral Finance paper to the general session of the Annual Meeting of the Academy of Behavioral Finance and Economics in Los Angeles. 118. October 2014 — At the height of an Ebola outbreak, Hall presents the socionomic view of epidemic disease at the annual Irrational Economic Summit in Miami. 119. October 2014 — Prechter presents “The Socionomic Theory of Finance: An Alternative to EMH and a Foundation for Technical Analysis” at the annual conference of the International Federation of Technical Analysts (IFTA) in London. 120. February 2015 — Elam addresses the American Association of Behavioral and Social Sciences Conference in Las Vegas. He discusses social mood’s influence on accounting regulations in the United States. 121. April 2015 — The fifth annual Social Mood Conference at Georgia Tech in Atlanta features presentations by Alex Bentley, Shikhar Agarwal, John Grable, Burnham, Whitmer, Lampert, Prechter, Hall and Elliott Prechter. 122. September 2015 — Lampert presents “A Real-Time Case Study of Russia’s Military Resurgence” at the Annual Meeting of the Academy of Behavioral Finance and Economics at Drexel University in Philadelphia. 123. October 2015 — Elam’s paper contrasting the socionomic theory of finance to traditional explanations for stock valuations is selected for publication in the Proceedings of the 23rd Annual Southwestern Business Administration Teaching Conference. 124. October 2015 — Galasiewski presents a socionomic analysis of the Asian region at the annual conference of the International Federation of Technical Analysts in Tokyo. 125. December 2015 — Hall introduces socionomics to the Interagency Health Leaders Roundtable at the National Defense University in Washington, D.C.
126. January 2016 — Prechter’s October 2014 presentation to IFTA is released on DVD. 127. January 2016 — The University of Warwick’s interdisciplinary two-day conference, “Mood—Aesthetic, Psychological and Philosophical Perspectives,” lists “Robert Prechter’s concept of mood in socionomics” as a topic of discussion. 128. April 2016 — The Institute inaugurates audio versions of The Socionomist. 129. April 2016 — Eugene Stanley, co-founder of econophysics, is the keynote speaker at the sixth annual Social Mood Conference at the Georgia Tech Conference Center in Atlanta. Prechter, Elam, Lampert, Kendall, Hall, Nerissa Brown, Jon Fassett, Alastair Macdonald and Robert Folsom round out the list of speakers. 130. May 2016 — Lampert, Elam and Hall present at the University of Warwick’s interdisciplinary conference on mood. Their topics are elections, social mood and epidemics, respectively. 131. May 2016 — Four years after posting, the Institute’s elections paper remains ranked among the top 2/100ths of 1% for download frequency among all 550,000 papers posted on the Social Science Research Network’s website. It remains SSRN’s most-downloaded paper of all time in both the Collective Decision-Making and Voting Behaviors categories. 132. September 2016 — Lampert presents “Past Performance is No Guarantee of Past Results: Evaluating the Disparity Between Benchmarks of Asset Performance and Investor Returns” at the Annual Meeting of the Academy of Behavioral Finance and Economics at the University of Nevada-Las Vegas. 133. November 2016 — Alyssa Hayden becomes the Executive Director of the Socionomics Institute and editor of The Socionomist. 134. November 2016 — The Institute launches the Socionomics Membership, which gives members access to everything the Socionomics Institute produces as well as archives. 135. December 2016 — The Institute launches Socionomics Institute Press. 136. December 2016 — Socionomics Institute Press publishes Prechter’s third entry in the socionomics book series, The Socionomic Theory of Finance. 137. 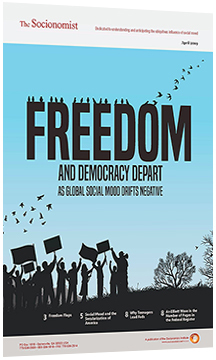 April 2017 — The Institute hosts the all-online Essential Social Mood Conference, a collection of presentations from the first six years of the Social Mood Conference by De Bondt, Prechter, Bollen, Mao, Olson, Hall, Boyesen, Buchanan and Lampert. 138. May 2017 — At the invitation of Elam, Lampert and Hayden introduce socionomics to students and faculty at Texas A&M University-San Antonio. The Institute donates its catalog of socionomics books and DVDs to the university library. 140. October 2017 — Lampert presents the Institute’s research on uncertainty at the Annual Meeting of the Academy of Behavioral Finance and Economics at the University of California-Los Angeles. 141. October 2017 — Socionomics Institute Press publishes the fourth and fifth entries in the socionomics book series, Socionomic Studies of Society and Culture and Socionomic Causality in Politics, collections of essays and reports from Institute researchers and other contributors. The two books hit twelve Amazon bestseller lists, with Society and Culture reaching #1 in social theory and Politics reaching #1 in behavioral psychology. 142. April 2018 — The Institute hosts the 2018 Essential Social Mood Conference, an online event featuring presentations from the first six annual social mood summits. Presenters include Robert Prechter, Burnham, Atwater, Agarwal, Wilson, Galasiewski, Elliott Prechter, Whitmer, Macdonald and Stanley. 144. July 2018 — The Institute donates its catalog of socionomics books and DVDs to the Rutgers University library.